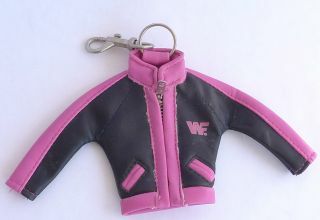 Someone Bought This: Bret Hart jacket keychain - WrestleCrap - The Very Worst of Pro Wrestling! 7 Responses to "Someone Bought This: Bret Hart jacket keychain"
I actually had this when I was a kid…I cut the key ring and loop off and it fit perfectly onto my Hasbro Bret Hart action figure! 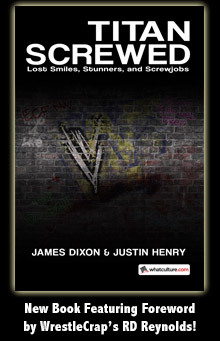 And although there was never a Jean Pierre Lafitte figure, I did “run an angle” where IRS stole the jacket and sold it to Ted DiBiase,who then gave it to Shawn Michaels…and yes, Bret got it back in a ladder match! My father built me a little wooden ladder for my toys! Man I miss being a kid! Ahhh…the good ol’ days…I was always upset that they never carried on this line of toys, Hasbro pumped out quite the roster of figures without many re-releases or repeat characters…Sure, there were 3 different repaints leading to multiple Warriors, Hogans, and Savages…But they didn’t oversaturate my figure Royal Rumbles with 4 Ricky Steamboats, 6 Bushwhackers, or 3 Jake Roberts’…Right up til the end I could eagerly anticipate a completely new character!!! Another item I have! They made the damn things out of pleather and you could even unzip them for some unknown reason. Now if they made a Jean-Pierre eyepatch keychain…CHA CHING!!! CHA CHING!!! !